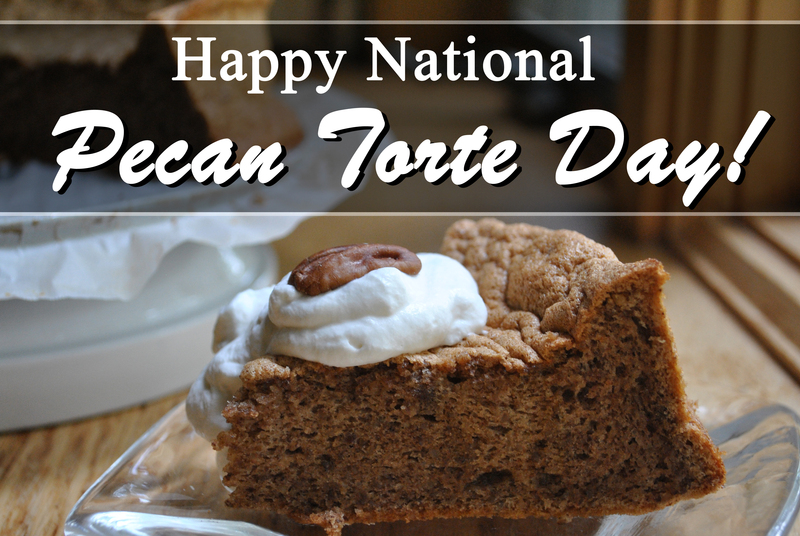 National Pecan Torte Day Recipe! Preheat oven to 325°. Line the bottom of a 9-inch cake pan with parchment paper. Combine the pecans, flour and salt in a food processor until finely ground; set aside. Using a stand mixer or electric hand mixer, beat egg yolks and 1/3 cup of sugar until pale and thick, about 2-3 minutes. Using a silicone spatula, fold in the pecan mixture and set aside. Be sure to completely wash and dry the bowl and mixer attachments, and use the mixer to beat the egg whites until foamy. Add roughly 1/3 of the remaining sugar, and continue to beat egg whites until opaque. Then add approximately 1/3 more of the sugar. Continue beating until egg whites begin to form soft peaks, add remaining sugar, and beat until soft peaks are fully formed. Fold the egg whites gently into the egg yolk-pecan mixture. Folding in the egg whites too soon will deflate the batter. Pour batter into prepared pan and bake for 35-40 minutes, until cake is lightly browned and a tester inserted into the center comes out clean. Remove from oven and allow to cool completely. Run a butter knife around the perimeter of the pan to loosen the edges, and carefully transfer cake from pan to serving platter. Serve plain or with whipped cream. The cream will whip better if you chill the bowl and beaters in the fridge before preparing the cream, so that everything is as cold as possible. Using an electric hand mixer or stand mixer, whip the cream until it begins to thicken. Add the maple syrup and continue whipping until cream reaches desired consistency. Either serve immediately or chill until serving. Check out chowbellaorama’s blog for more awesome posts like the one we featured here!